June | 2008 | Two cultures, one mind. iPlayer – pattern to problems? I had one of my frequent bouts of insomnia last night, so at 2am I thought I would give in and watch some BBC programmes via BBC iplayer. I’ve recently downloaded the client to my laptop, because of various problems in the past, despite my reservations (well, rant) when I tried the client last year. Of course, the client is Windows only, so I have to run Parallels, then iPlayer client. This works, and it overcomes the streaming ‘stutter’ which plagues my watching anything using the flash page. But, at 2am I thought traffic would be light, both on TalkTalk and from the BBC, so settled down with a cup of hot milk to watch Top Gear. The stream still stuttered around once a minute, and even my usual trick of pausing playback for around five minutes, then playing the stream didn’t work. I know my broadband connection is a soggy piece of string, but it’s stable in all other applications (even YouTube! ), here’s a cut/paste from my router’s page as I type. But to confuse the issue, as I type this on Big Mac, I’m watching the live flash video stream of the Any Murray v Richard Gasquet on MacBook. It’s been streaming for about fifteen minutes, at 6:30pm which must be peak ‘Internet time’ both for TalkTalk and the BBC. And the only stutter has been when I fired up a very media intense web page! So I’m now confused. Why can I stream a live video in high enough quality that I can spot a green ball on a green lawn, which is being watched concurrently by tens of thousands of people, when I cannot watch a pre-recorded programme using BBC iPlayer (I tried the original player, and the new beta service just in case). I can’t wait for the mac client to arrive, which should by then provide additional functionality such as ‘series link’, and maybe, just maybe an extension to the restrictive 7 day watching period once download starts. Not that Big Brother – I’m too emotionally traumatised after watching Doctor Who to consider watching fifteen idiots willing to let them be watched 24 hours a day. 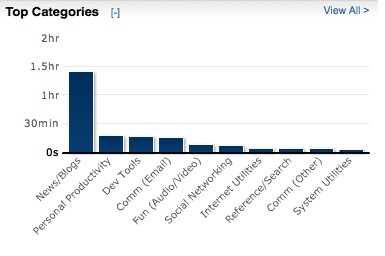 But, I was prompted by the (as usual) excellent Web Worker Daily to consider looking at RescueTime. It’s an application which you install onto all your machines (Windows, Mac and Linux), and it monitors both web sites and other software, and creates reports. You can also create a web-widget so that others can see what you’re doing – but that’s a little too much exposure for all of the time which I’m in front of a computer. Here’s a snapshot as of today, as of 9pm. Maybe I am a news addict after all! I’ve installed it on all my home machines, and will do the same on my work one if it can cope (I’ve managed to get the 40 minutes from power-on to being able to send emails down to less than 10 – but I don’t really want to add another application to start-up, though it appears to be very efficient. Meanwhile, I’m getting ready for a tough weekend of OU marking ahead – lots of assignments to mark before my holidays. It’ll get done as always. I’m definitely back in the swing of things at work now. It’s been a busy day with my final routeway board as ITMB course director today. All went well, thanks to some good administration and management support. The rest of the day has been spent moderating MSc work, and preparing emails to students in anticipation of the results being released. One thing that I am significantly behind with at the moment is preparation for next year’s teaching. It seems a long way off (94 days according to a quick calculation), but take out weekends (26 days) and holidays (15 days), clearing and Open Days (say 5 days), and we’re down to 48 days.. I’m going to stop now otherwise I’m going to start panicking again. I’m just trying a collaborative mind-map, to see if this is a way that I can work with colleagues when shaping the new module. It may work, it may not, but it’s worth a try, and if it is successful, is something that can be shared with other colleagues. I’m using the online package mind42 for this, which I’ve used on my own in the past, but this is the first time that I’ve tried using it in a collaborative way. 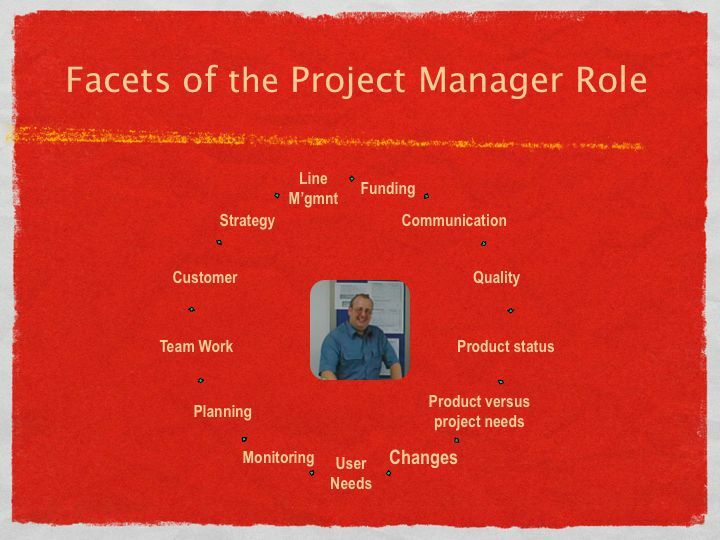 Meanwhile, I’m still working on the Scrum lectures for the advanced project management module, trying to find case studies which are (relatively) short, but don’t appear to be a sales pitch for Scrum itself. It’s hard work, and I may end up adapting one of the ‘classic’ case studies which we use. This is a shame, as I was also keen to bring elements of International Business into the module, but writing good case studies is notoriously difficult, even with a creative writing course under my belt! There are resources which can easily be found through Google, and I’ve spent some time working though these, but many of these are written for business to business, or to subtly sell consultancy. Still, the evaluation will continue. I do try and use the skills picked up many years ago from the SAFARI online learning course developed by the Open University (and now available to all for free I’m pleased to note) to evaluate online resources, but having spent so much time online I guess that I’ve developed an ‘instinct’ rather than following through a specific criteria for a website. If I finally do bite the bullet and commit to a Higher Degree, this is no doubt something I will need to revisit. Still, the weekend beckons, and less than a fortnight before I’m on my holidays! Back to work tomorrow. I’m not 100%, I would reckon 85%, rising to about 90% in the morning but falling off to 75% come the evening. It appears that I’ve been lucky, bronchtitis can take much longer to clear up. There’s not much else to report – I’ll drip out a few techie postings over the next few days for various tweaks and gadgets which I have been playing with over the last week. It’s amazing how difficult it is to get back into the blogging habit, after a week away. I’ve been signed off work by the doctor for a week, with bronchitis. And I thought it was only the old or smokers who got it – and I’m neither… yet. I’ve been advised to rest… whilst it didn’t explicitly state this included no blogging, I think it was implied. I feel a little better today, and whilst occasionally having a coughing fit, and worried about a headache which is niggling me behind the eyes, I’ve been able to return to ‘light duties’. One of these duties has been to get used to the iWork applications, and particularly Keynote, which was one of the the main reasons which I purchased the package. Loading almost instantly, so quickly that a few times I wasn’t sure that it had loaded. This pattern is the same throughout all of the iWork apps (Pages and Numbers), and really is a time saver. I guess if Apple can’t produce applications which load quickly on their own hardware, then no-one can. Keynote appears to cope with all of my PowerPoints from the 2003 version of the software. I had a scare when it appeared not to be able to read files off my pen drive, but this was tracked to corrupt files on the drive – this has happened a few times now and I guess you get what you pay for when you pay less than £10 for an 8 gig pen drive from eBay – lesson learned. The software is clear and intuitive, even the ‘Inspector’ window which I’ve seen in some other Apple apps makes sense once you consider it as an ‘intelligent properties’ window. I’ve worked on three PowerPoints today, adopting a standard Keynote template to each one, and they do look good (even better with animation!). Exporting the Keynote file formal (.key) into PowerPoint (.ppt), then opening it in NeoOffice works – the only thing which is lost is some of the more impressive transition effects. The plan, certainly for the modules which I’m teaching on my own anyhow, is to use the dual-screen mode with the MacBook directly connected to the PC projector. There’s no reason why this shouldn’t work. As an added bonus, my Apple Remote can act as a ‘clicker’ – meaning I can be more flexible with my delivery, and be a little more ‘animated’. I have taken it steady though, and did get a little distracted by trying to work out how to embed the following YouTube video into a slide (rather than just a hyperlink). The final ‘very nice’ is that it’s a doddle to export the presentation as a ShockWave file, making for the ultimate in portability, and great for e-learning environments such as moodle, but not, alas into WordPress as .swf’s are ‘banned’. And I haven’t even managed to start looking at Pages and Numbers yet! I’ve been off work sick the last couple of days, not great timing for me with no bathroom in the house for much of the time. Still, I can always rely on the kindness of strangers… actually I can’t, and have been relying on the bathroom and coffee shop of the ‘local’ Sainsbury’s – when you have to drive ten miles round trip you do seriously consider if you *have* to visit the loo! But it does mean I was at home when my copy of iWork arrived. I downloaded the 30 day trial version, and found that it did most of what I need from a word processor and spreadsheet, and much more than I needed from a presentation graphics program. You’ll recall that’s my big problem with NeoOffice – apart from being a little unstable in places, Impress simply doesn’t do what I need to create my teaching lectures. I’m booked into the docs Monday, and then the plan is still to head to Greenwich for my external examining, but it depends how I feel after the weekend. Fortunately ‘the cat’ (see some of the comments to previous postings) is coming round later today to bring me a important folder, and news of the outside world.